Against a number of improvements, there are several signs that the consumer may be weakening. On Monday I gave what I think is a reasonable roadmap to the next recession. I wanted to follow up a little. The post from nearly 10 years ago was entitled, "Are Hard Times Near? 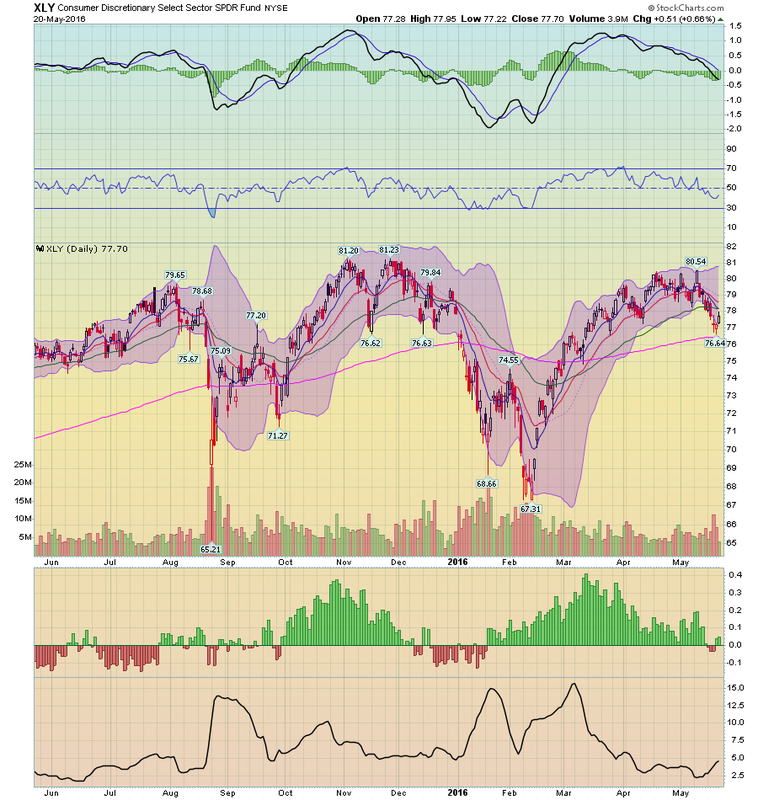 The great decline in interest rates is ending." The theory is right in the title. Since the 1970s, real average hourly earnings had declined. Average Americans coped by spouses entering the workforce, by borrowing against appreciating assets, and by refinancing as interest rates declined. By 1995 the spousal avenue peaked. 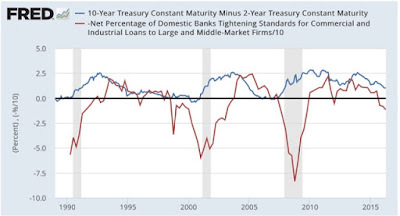 Borrowing against stock prices ended in 2000. Borrowing against home equity ended in 2006. When interest rates failed to make new lows, the consumer was tapped out, and began to curtail purchases. 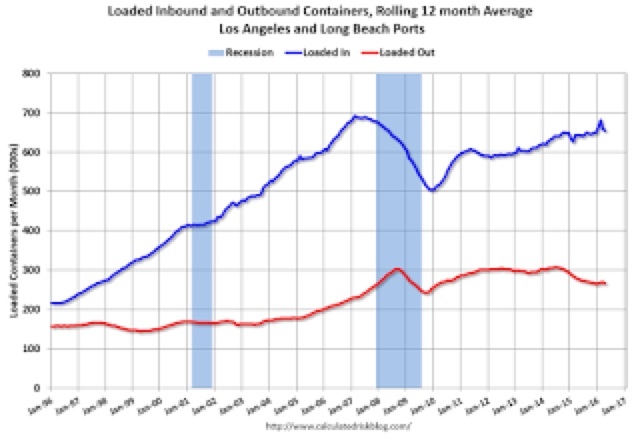 A recession began - and its effects have lingered and lingered. Hard Times were indeed near. In that article in 2007, I wrote that the consumer might yet have one more chance to refinance debt. In fact after the recession it turned out there were two: in 2009 and again in 2013. Ten year treasuries made a 60 year+ low in 2013 at 1.50%. Even if treasuries, and mortgage rates tied to them, make a new low, the floor is somewhere north of 0%. That -1.5% decline in a mortgage payment on a $250,000 house would be $3750 a year, or a little over $300 a month. That's the most extreme case. Even if interest rates make new lows, households that refinance are likely to see more on the order of $100 or $200 per month of freed up cash -- not enough to power much consumer spending. Because a refinance isn’t free, a simple rule of thumb is to add 100 basis points to the current market mortgage rate as the rate at which borrowers would have an incentive to refinance.... According to the chart [bleow], most borrowers hold mortgages with rates up to 4.50 percent, with 62 percent of mortgages and 72 percent of UPB in this range. 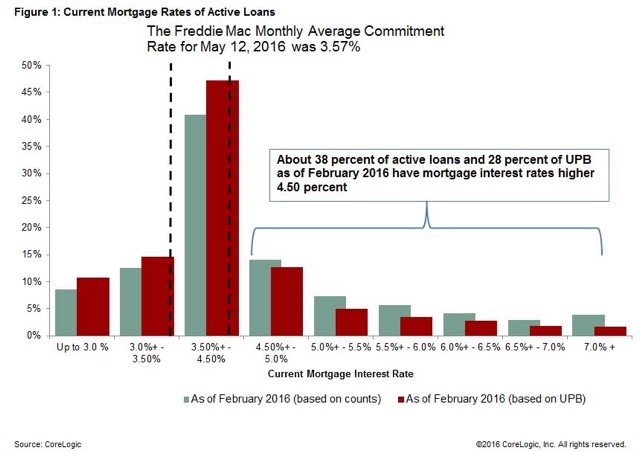 If mortgage rates rise as predicted, we will certainly see refinancing volumes fall in 2016. 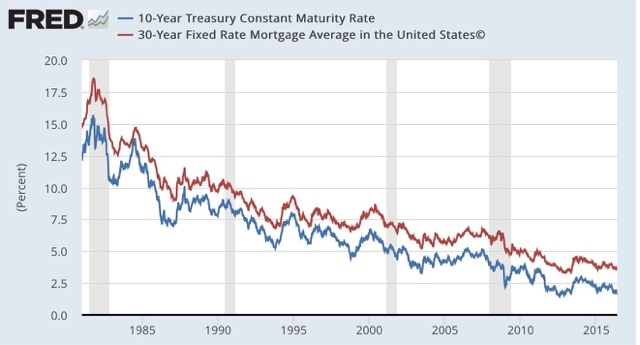 Note there is a small share of outstanding mortgages with interest rates of about 300 basis points or more above the current market rate. 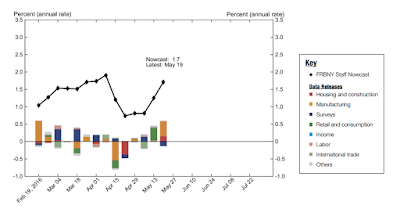 Currently nominal wage growth is running at about 2.5% YoY. Real wages have been boosted in the last 2 years by collapsing gas prices. Once that is over, what happens next? Even 2% YoY inflation eats up nearly all of consumers' wage growth. A 3% YoY inflation rate means real wages decline. So the bottom line is, we are already in a period - a period that I expect to last an entire generation - where real gains by average Americans won't be available from financing gimmicks, but must come from real, actual wage growth. At the moment I see little economic or political impetus to make that happen, even though average Americans understand via their wallets the issue all too well. Eventually it will happen, but I believe between now and then is another recession, one that I fear is likely to be worse than the 2008-09 recession because it is likely to include a spasm of wage-price deflation. All investments involve risk. So does this one. Please talk with an adviser before buying this stock. And, as always, remember that I could be wrong about this. 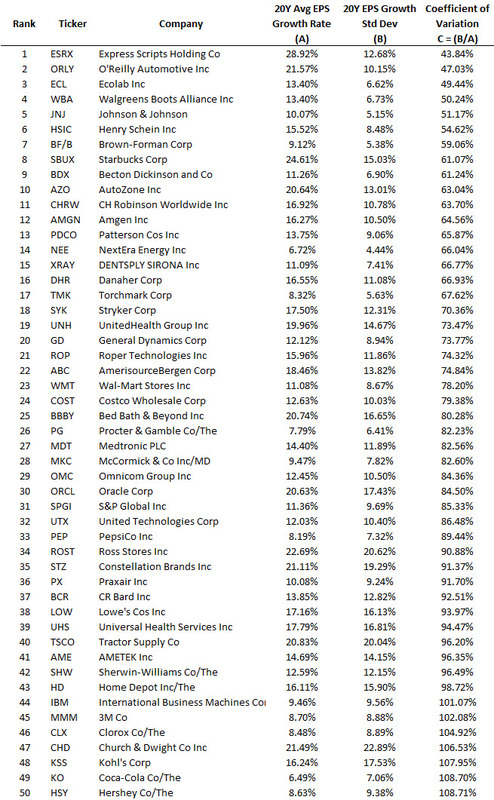 This drop occurred during a weak first quarter retail environment. In the latest GDP report, personal consumption expenditures increased a disappointing 1.9% Q/Q. Real retail sales were flat for the January-March period. 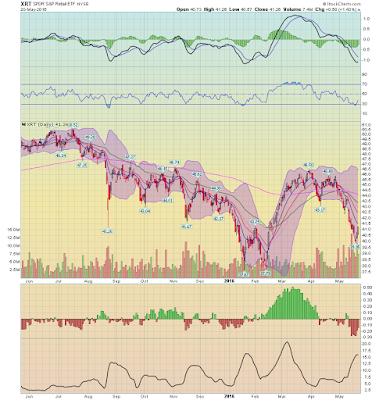 This caused disappointing first quarter fiscal results that led to a 14% drop in the retail sector ETF (the XRTs). 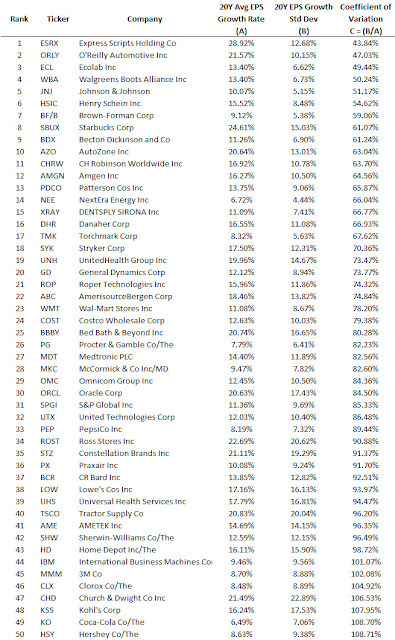 And retail executives were very circumspect in their first quarter earnings calls. But several recent statistics could indicate the 1Q malaise is over. The latest 1.3% rise in retail sales is very encouraging. Analyzed in isolation, this release could be viewed as statistical noise. But the recent 16.6% rise in new home sales shows the U.S. consumer is more than willing to spend, potentially foreshadowing a much stronger 2Q GDP result. It’s important to place Target’s quarterly results into a longer time frame. Target’s total revenue has fluctuated between $72.5 and $73.7 billion over the last 5 years. COGS and operating expenses have been consistent, indicating the company has control of expenses. 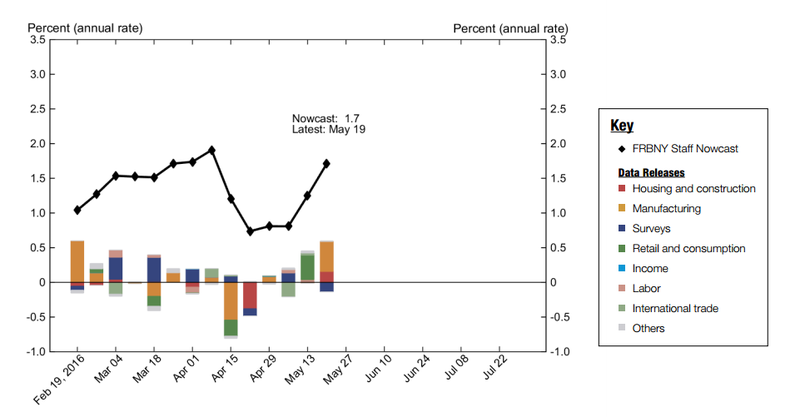 EBIT fluctuated between 8.89% and 10.67% since 2010. And they have reported positive earnings in all but 1 of the last 5 years. This is a consistent long-term performer that, so far, simply experienced a bad quarter. There are two potential market scenarios going forward; either makes Target a buy. The company is a discount retailer, which naturally attracts shoppers during economic slowdowns. In fact, their gross revenue increased $9.25 billion between 2007 and 2009. And if the economy continues growing slowly, they’re still a buy. They have solidly positioned themselves as a discount store that is attractive to higher-end shoppers. A recent Facebook meme perfectly captured this sentiment: “Target: where you’ll pay an extra $5 to not be seen at Wal-Mart.” The stock is trading at the bottom of their 52-week range with a 3.23% dividend yield and a 41% pay-out ratio. The company also has a buy-back plan in play. These factors add up to a great buying opportunity. I've written about several legitimate bearish concerns in the last couple of weeks. First of all, the inventory to sales ratio is one that has frequently (but not always) been associated with recessions. 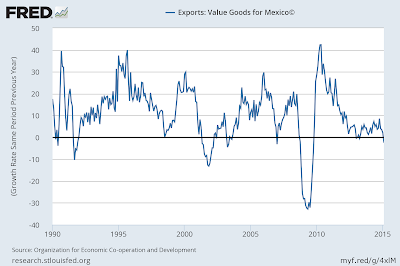 Secondly, transportation of all sorts is solidly negative YoY - even against poor comparisons. 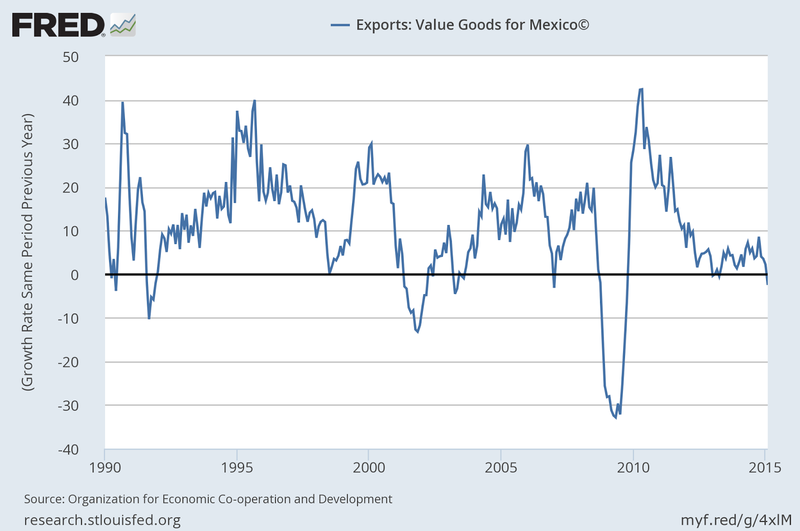 Since goods have to be transported to market somehow, this confirms ongoing weakness -- not just of commodities, but to a lesser extent of finished goods as well. One important limitation of this series is that there is less than 30 years of data, and 3 recessions. 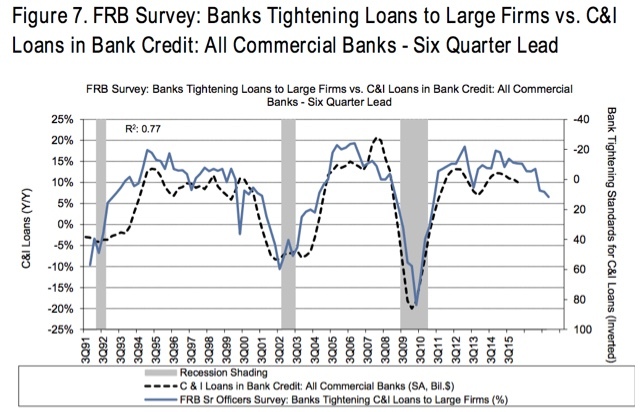 This limited data sample does indeed suggest that net tightening of credit is a long leading indicator for recession (although note that we aren't yet at levels of tightening associated with the onset of either of the past 3 recessions). 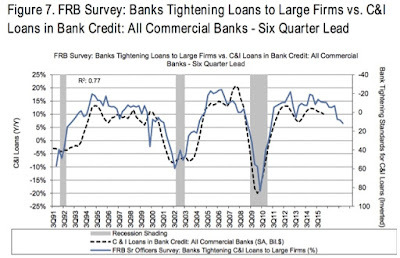 But what drives tightening? Is it an independent variable, or is it in turn driven by something else? Does it give us new information, or just confirm other information? 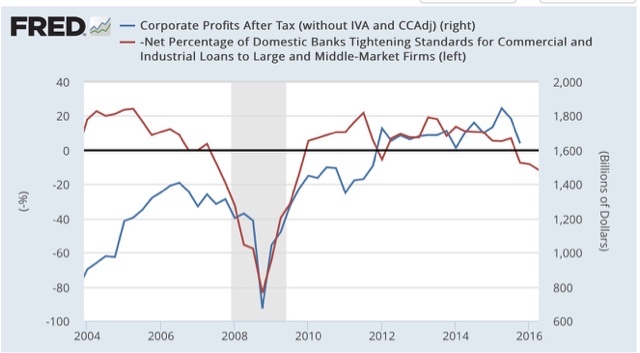 My suspicion is that credit tightening is a reaction to a decline in interest rate spreads, and a deceleration of corporate profits. 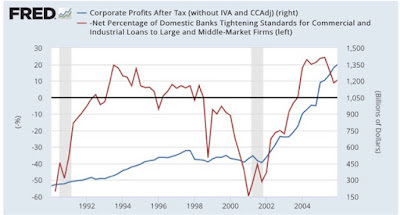 Banks make less profit on loans as the spread between short and long term interest rates decline, and as they see corporate profits stalling, it would be reasonable to take less risk. 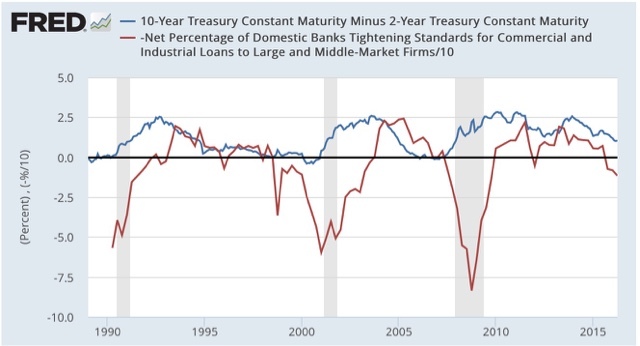 A decline in yields between short and long term maturities has reliably led to a deceleration in the expansion of credit by banks, with a lag of between 12 to 24 months. 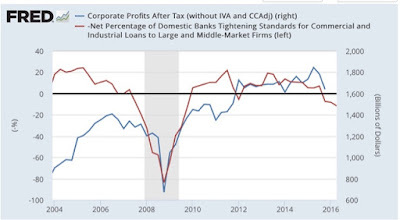 What we see is that the increase in credit loosening peaks before profits, but conversley an outright decline in corporate profits signals a net tightening (i.e., crossing from easing to tightening) in credit availability, usually with a short lag on the order of 1 quarter. So credit availability does appear to be a leading indicator, but it may be mainly confirmatory of the yield curve and interrelated with corporate profits. 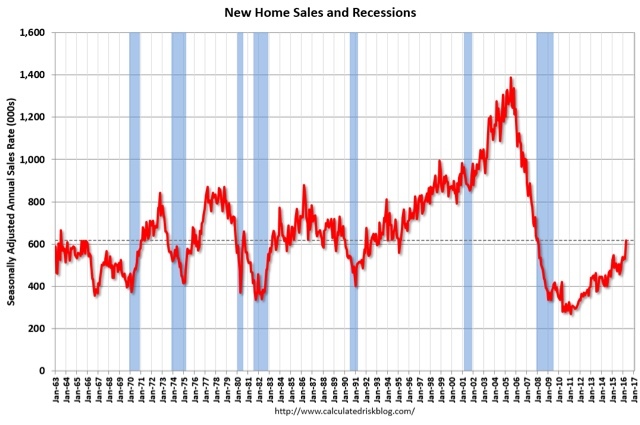 2.9 cheers for new home sales! But that *if* is very important. New home sales tends to have upside or downside outliers once or twice a year. And large revisions to those outliers are the norm. 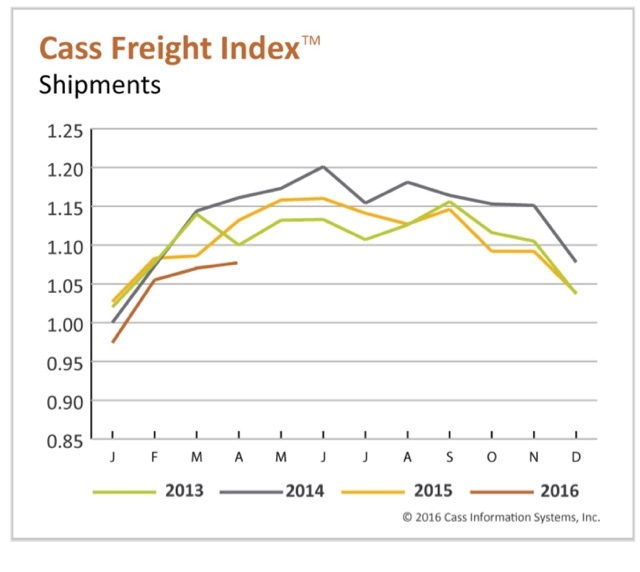 For example, August 2014 was originally reported at 504,000, but the next month was revised down to 466,000. So it remains a significant possibility that this months blowout number will be revised down, and yes possibly as much as 70,000, which would put it under February 2015's previous high. So, 2.9 cheers! Subject to revision. While I continue to be mildly optimistic about the economy for the remainder or this year, there are some legitimate pessimistic arguments. I've discussed the inventory to trade ratios earlier this week. The second such pessimistic metric is transport. 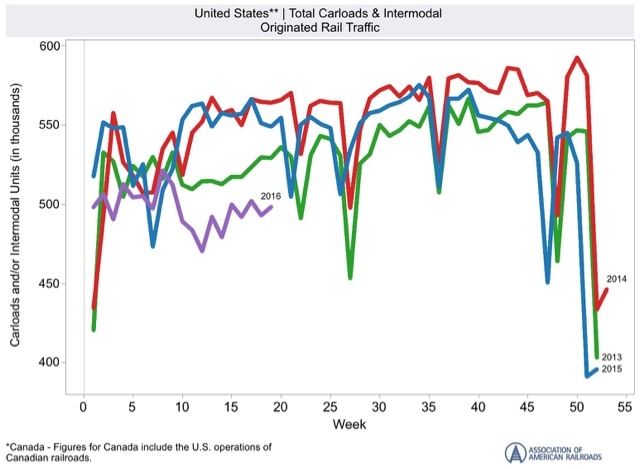 It's worthwhile, however, to break out rail further by dividing between intermodal units (which tend to be manufactured goods) and carloads, which tend to be commodities like coal, mineral ores, and oil. 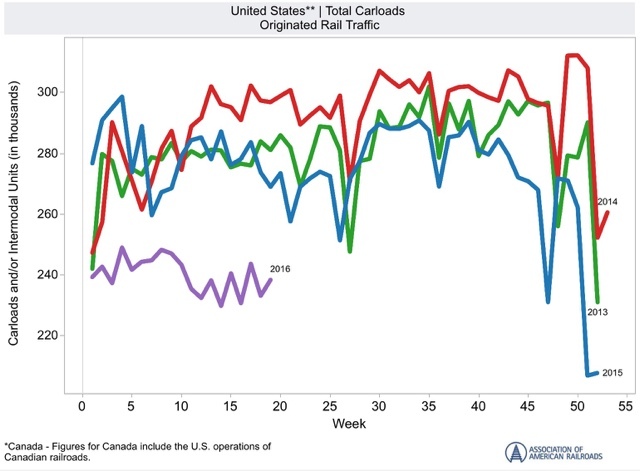 But while rail daa has the advantage of being reported weekly, it is worthwhile to see whether or not other forms of transportation are confirming the signal. 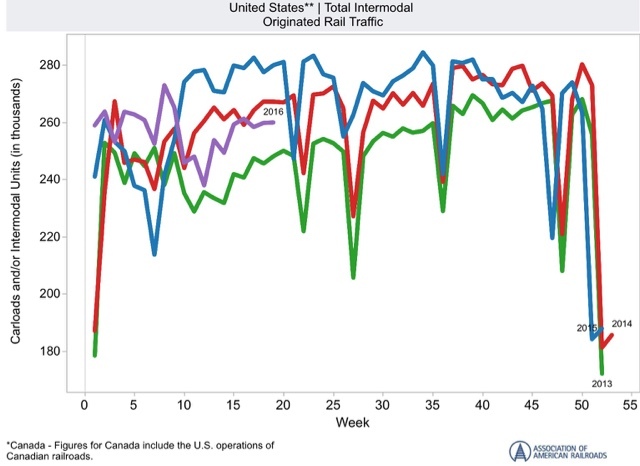 While April improved over March (not surprisingly given seasonality), both March and April are well below last year's numbers, roughly in keeping with the intermodal decline in rail. 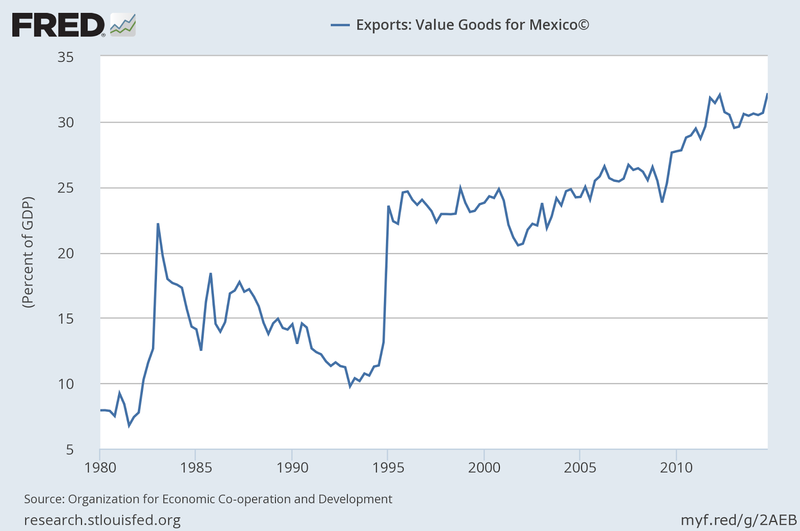 Exports are more raw materials, and imports are more intermodal consumer goods. 1. 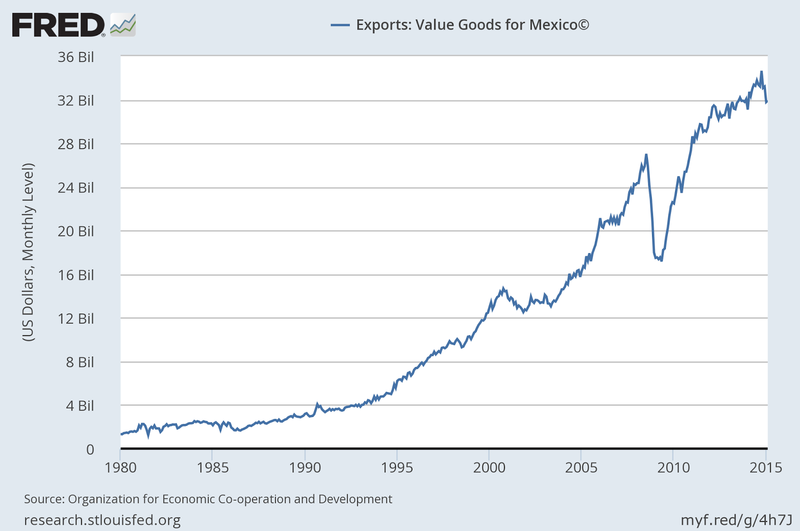 On a global scale manufacturing has been negative. 2. 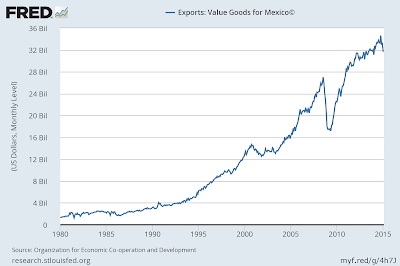 The commodity collapse - at least in terms of commodities supplied - is continuing. I suspect that commodity *prices* have stabilitzed because output declines are no longer outpacing supply. 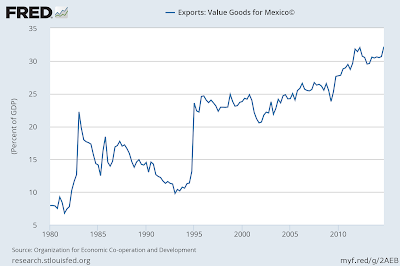 Trump has used clearly racist language to describe Mexicans, who happen to be a one of our largest trading partners. By the way, the template I am using now is the same one that enabled me to see the last recession approaching a year before it struck.